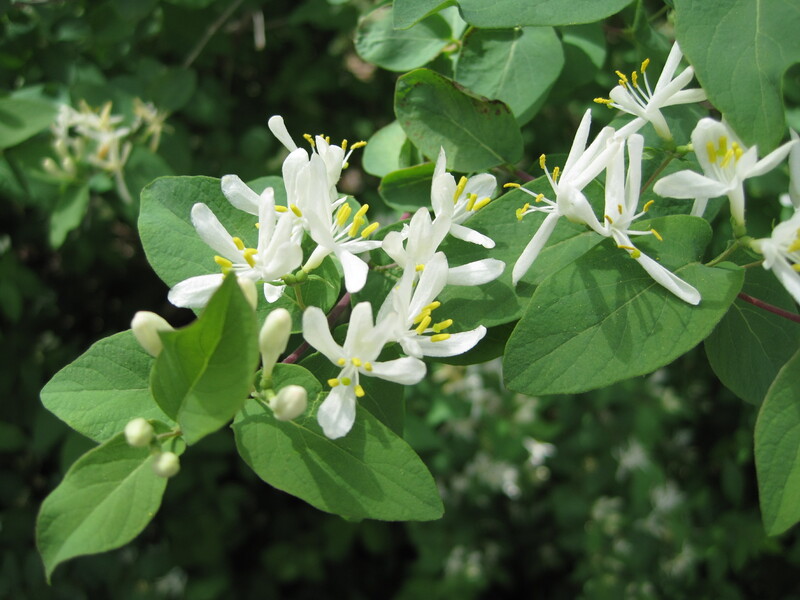 Description: Honeysuckles are deciduous shrubs ranging from 6-15 feet tall at maturity. Shrubs leaf out early in spring, typically before native trees and shrubs. Several species in the northeastern U.S. are invasive, including hybrids among invasive species. The arching growth form of all the invasive bush honeysuckles are similar, however. Rough bark and arching branches are characteristic of honeysuckles. 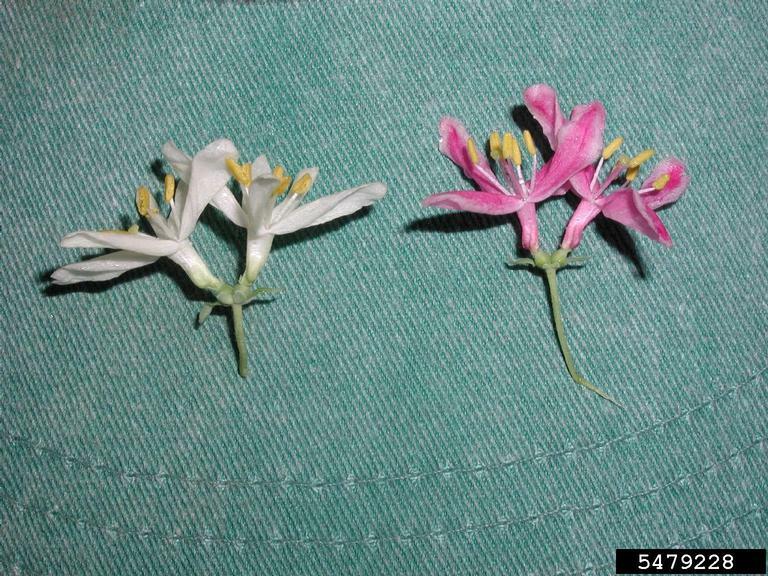 Variation in Bell’s honeysuckle blossoms. Habitat: Honeysuckle prefers disturbed partially shady forests, edges, and upland habitats. 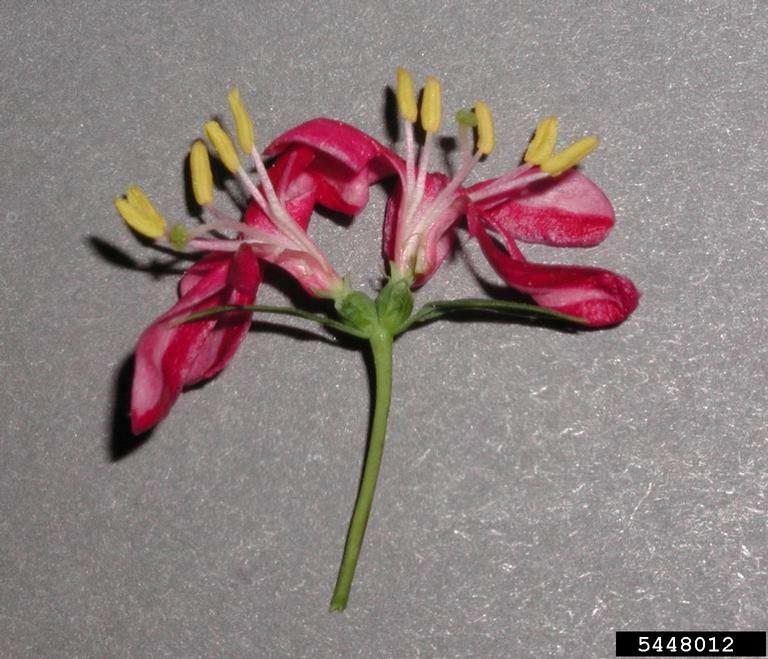 Invasive Traits: Honeysuckle produces large quantities of fruit which are dispersed by birds and deer. Cut stems will resprout vigorously. 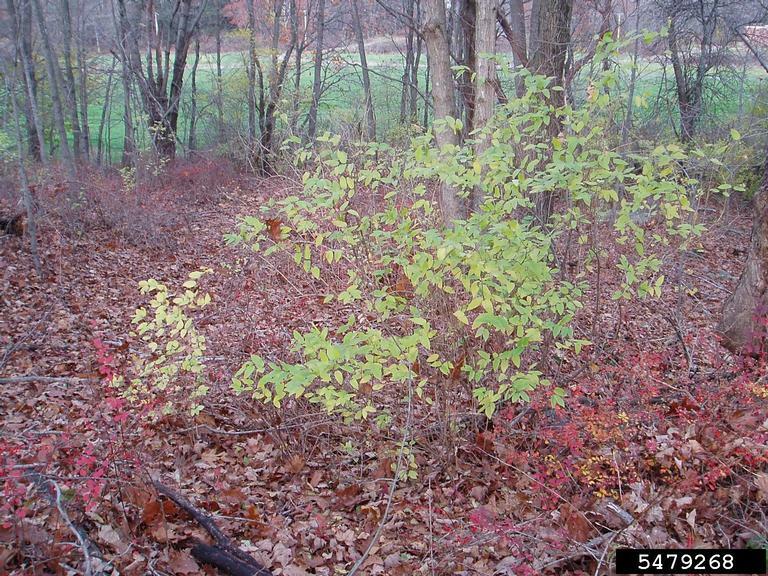 Dense thickets are unattractive to grazers and also shade out native vegetation. Asian bush honeysuckles bear shiny red fruit in the summer. Amur honeysuckle shown. Leafing early in the season and dropping leaves late in the fall allows honeysuckle to compete with surrounding vegetation for sunlight. Control: Cutting can be effective only when repeated. 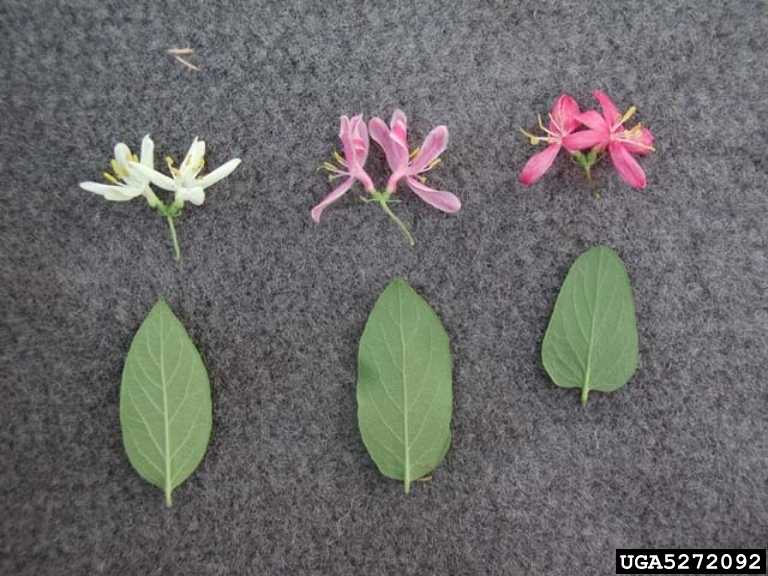 Selective herbicide treatment via cut stump, foliar spray, or basal bark is most effective, especially during fall when honeysuckles are most easily distinguished from native vegetation. 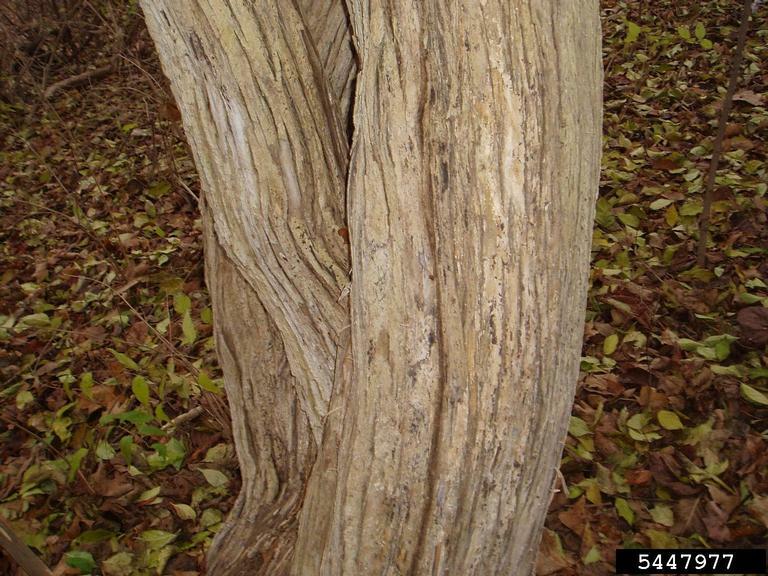 Asian bush honeysuckles have an arching habit. Amur honeysuckle fruit. 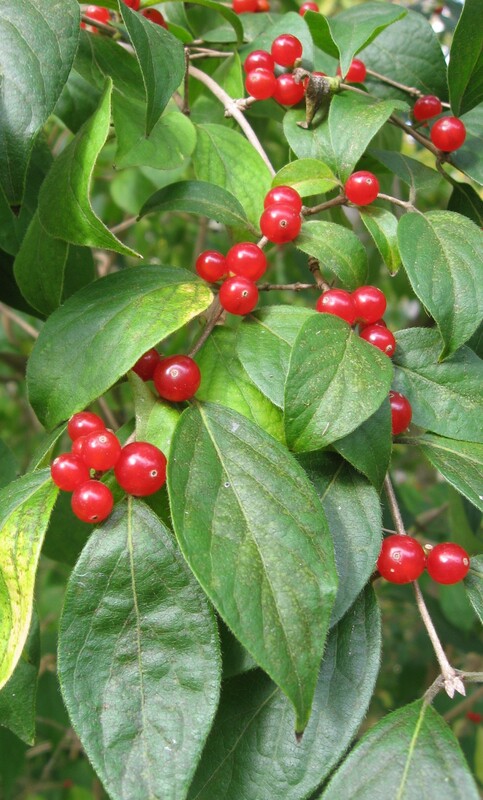 Fleshy, paired berries are distinctive on these shrubs. Mature bark of bush honeysuckle splits into long furrows.